We’re in a time of absorbed but subtle and not fully noticed shifts. Old-time liberals and conservatives seem to understand each other more deeply, more generously than they did in the past: In some new way they see the other’s basic political decency. On the other hand the parties they’ve been aligned with offer constant confusion and surprise. And yet he raised a hearty $6 million in the 24 hours after his announcement for the presidency, and draws adoring crowds. In comparison no one seems to be talking about Elizabeth Warren. What I see there, for all the Pocahontas and DNA gaffes, is earnestness and seriousness of purpose. She was a progressive before progressivism was cool. She is absorbed by policy. She is an undervalued stock. A basic fact of this presidential cycle: When Donald Trump walked through the door, he burst off the jambs and made the opening bigger and more jagged, forever. Now almost anyone can walk through. A second fact is that the Democratic Party been tugged dramatically to the left. But there is another dynamic this presidential campaign, and I will use Bernie Sanders to make the point. I always thought that if he’d gotten his party’s nomination in 2016 he would have beaten Donald Trump. America was going left, he had been in Congress 25 years compared with Trump’s zero political experience, he was a new face and yet an old one, and not thought corrupt. Mr. Sanders had something else, an unseen asset. In 2016 voters who wanted major change, who wanted greater economic equality or more-expansive programs, knew that if they hired Bernie Sanders he’d come in and push things in the direction they desired. They also knew Republicans in Congress would push back. And because of that pushback nothing insane would happen. Things would tilt left but a Sanders administration would likely not be extreme because it would not be allowed to be. Now that’s changed. Republicans lost the House and hold the Senate only closely, their power to push back is diminished. Voters know this. If a hard-line lefty were chosen as the nominee next year, extreme things would seem quite possible. Which will give a lot of voters pause. The new lefties are a minority in the House but have become the face of the party, its brand. Rep. Alexandria Ocasio-Cortez is more famous than candidates for president. The left has the energy, the excitement, the media pull. Readers know how I feel about the current political atmosphere. I decry the air of accusation on social media and in our broader political life, and the spirit of the struggle sessions of the Chinese Cultural Revolution. Last weekend there was the video of a pregnant Chelsea Clinton being accosted by an New York University student who screamed at her and waved her finger in her face. 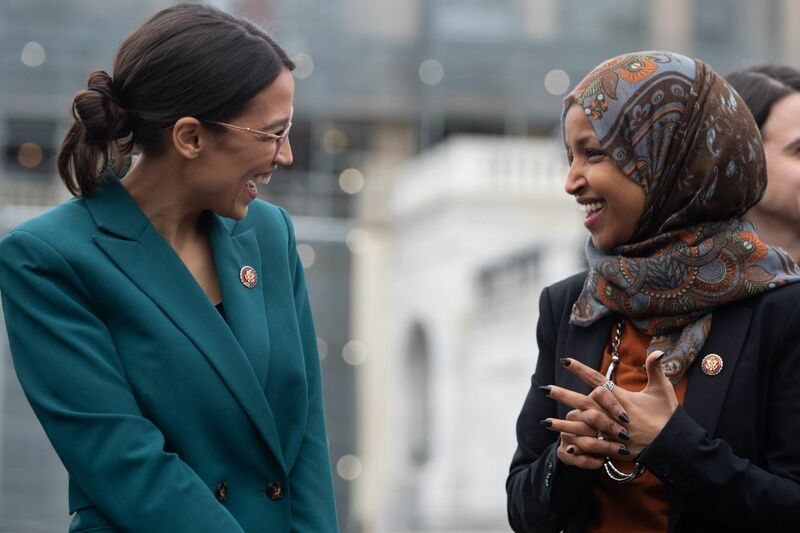 It reminded me of a struggle session, but the student herself, in her certitude, self-righteousness and chic, also reminded me of Ms. Ocasio-Cortez and her friends in Congress. I’m sure she’ll do what she can to keep things exciting. As for the imitators of the new style, they are making category errors. Courtesy, for instance, is not cowardice. It is not shrinking from real truths or their bracing expression. Courtesy is simply an act of public or private respect that comes from self-discipline, and self-discipline is not boring and antique, it’s a heroic little item that helps civilization to continue. There is always a great temptation among the young in politics, and especially of the left, to see common respect as an admission of insincerity in opposing injustice. If you were sincere you’d be passionate—fierce and rude. They see courtesy as acceding to bourgeois political norms, when they are certain the bourgeoise established those norms so they’d never be called out and forced to admit their culpability. They believe that to be enraged is to demonstrate seriousness. It is to show that you understand the urgency of the moment, even if others don’t. To behave in a way that shows respect for the humanity of others is to concede too much. After all, if they were truly human they’d be just as enraged as you are. You must be crude to show the authenticity of your contempt for injustice. A gentle word is a useless word. But in reality you can’t have justice without mercy, it doesn’t work.